This is a bit like a ‘buy one, get one free’ offer because when you visit Hawson Cross you get the Stumpy Oak for nothing. This is simply because both stand within a few feet of each other on a small island of grass at a road junction. Before 1887, William Crossing, (1987, p. 105), notes that the upper portion of the cross was built into the wall at the entrance to nearby Hawson Farm. He also notes how one of the arms had been broken off by a wagon wheel but fortunately had been kept and re-united with the rest of the cross. At that time, Crossing recorded the dimensions of the cross shaft as being 33″ high and 9½” wide with the arms measuring 10½” deep and 31″ across. The original site of the cross was then thought to have been, “close to an old oak near the junction of roads hard by“. Today the old cross once again stands close to the old oak and has done since it was restored by the Dartmoor Preservation Association in 1952. The restoration work involved adding a new shaft which according to Harrison, (2001, p.46) was designed by Masson Phillips the latter-day cross guru. The old cross sits in a socket stone which today is mostly buried beneath the turf. The Hawson cross in its present form measures 87″ high with the arms spanning 32″ and the shaft having a circumference of 45½”, (Sandles, 1997, p.44). Like many of Dartmoor’s stone crosses Hawson Cross is a scheduled monument which was first listed in 1972 with an amendment in 2003. As cross types go, Hawson Cross can be classified as a wayside cross of the Latin style which probably marked the old monastic route known as the ‘Monk’s Path’ which ran between Buckfast and Buckland abbeys. The cross has also been known variously as; Scorriton Cross, Holy Brook Cross and Stumpy Oak cross. As mentioned previously, Hawson Cross has a venerable neighbour in the form of a pedunculate oak tree known as the ‘Stumpy Oak’. This tree is but one of two on Dartmoor that are officially recognised as being, “historic oak trees” and appears on the Woodland Trust’s tree register as number 2281. Here it is noted that the tree is, “alive” which is always a good sign and at a height of 1.5m has a girth of 3.5m. Sadly its condition is not that good as there is decaying wood in the crown, the trunk is hollow with water pockets or holes which in effect means that one day the venerable oak will be lost to the ravages of time and weather. However, forewarned is forearmed and if you look at the photograph above you will see that to the right of the oak now grows the young ‘Sturdy Oak’ sapling. Today (March 2018) the young tree has already grown a good few feet higher than Hawson Cross with some promising limb development spreading outwards. I cannot believe that this ancient oak is simply a tree placed at a road junction, it can clearly be regarded as a ‘cross oak’ as these along with stone crosses marked road junctions but there must be more. It will need some work at the records office but I am sure that this old oak must mark the boundary of something, it’s too close to Holne to be on the parish boundary but maybe it’s on some manorial bounds? It does not take a lot to imagine a lone monk sheltering under the spreading branches of the venerable oak from a moorland squall that has interrupted his journey to Buckland Abbey. Listen carefully and you can hear the low murmuring of his prayers as he kneels beside the towering granite cross which marks his way along the Monk’s Path. This truly is a mystical place to visit especially at dawn and sunset and there is a magical atmosphere which has been brilliantly portrayed by Alan Maine’s photo above for which my thanks go to him for allowing me to use it. Harrison, B. 2001 Dartmoor Stone Crosses, Halsgrove Publishing, Tiverton. Whilst Driving past this rather attractive combination of Hollow oak and cross I asked for my wife to stop the car for a picture as it struck me that this is of some local significance . 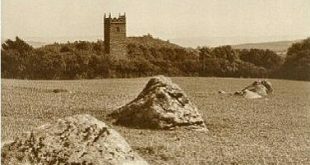 My research led to your site which is a wonderful testament to this intriguing combination and indeed to the whole plethora of History on Dartmoor.